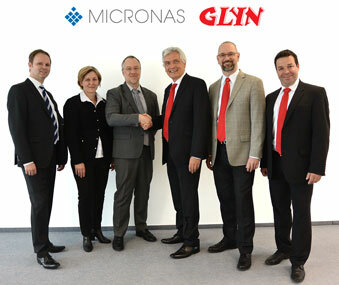 MICRONAS and GLYN expand their partnership. With immediate effect, GLYN GmbH & Co. KG is the franchise partner of MICRONAS GmbH for the sale of MICRONAS products within the economic area of Europe, the Middle East and Africa (EMEA). The distribution contract encompasses the whole MICRONAS product range of Hall effect sensors and embedded motor controllers. GLYN is also offering its design customers in EMEA comprehensive support and worldwide logistics. "The high product quality and quick response times and delivery times of MICRONAS are highly valued by our customers. GLYN is known for its exceptionally good system support and its sophisticated logistics", says Bernhard Huber, Vice President Sales and Industrial at MICRONAS. "Together we are developing strong solutions for our customers in the automotive and industrial sectors. From now on, even beyond Europe." "MICRONAS products have proven their value a million times over in automotive and industrial applications. We are pleased that we can now offer these high-precision sensors and controllers to all our customers in EMEA", remarks Glyn Jones, Managing Director & owner of GLYN, who values the expanded partnership. "Together with the outstanding quality of MICRONAS products and our in-depth technical support, we are expecting strong opportunities for mutual growth." MICRONAS, a company in the TDK Group, is the preferred partner for sensor and control technology. MICRONAS counts all major manufacturers of automotive electronics among its customers worldwide. The holding is based in Zurich (Switzerland), while the operational headquarters are located in Freiburg (Germany). The MICRONAS Group currently employs around 900 employees.